Frank Auerbach (1931 – ) has lived and worked in North London, painting the people and urban landscapes near his studio in Mornington Crescent since the fifties. 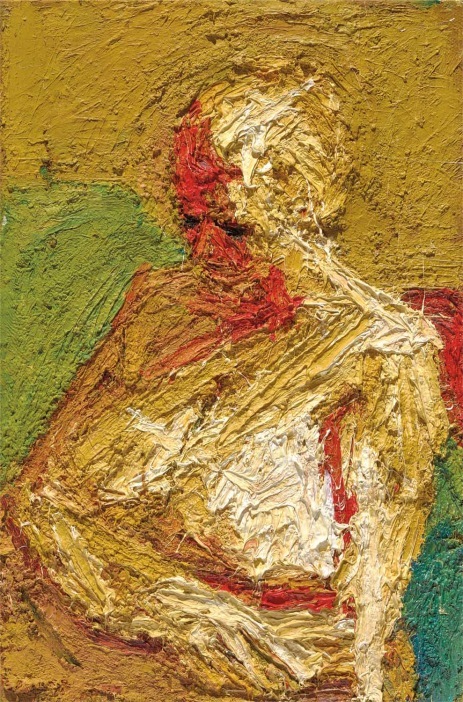 Born in Berlin but shipped to the UK in 1939, aged seven, by his parents (who subsequently died in a concentration camp ) Auerbach is one of the generation of British artists which includes Lucian Freud and Francis Bacon and, like them, he is a figurative painter. The current exhibition at Tate Britain ( Pimlico station, Victoria Line or number 88 bus from Trafalgar Square ) is curated by one of his long-time subjects, Catherine Lampert, and paintings in the first six rooms have been selected by Auerbach himself. These are what this artist wants people to see. Although he is famous for the intense relationships he forms with his sitters whom he paints again and again and with the places near his studios, which figure in his work over and over, his selections are, intentionally, very different from each other. So there is no immediately discernible chronological or narrative development between the paintings. Auerbach has said that he wants each work to be treated as absolute in itself. Nonetheless the rooms are arranged by decade, from 1950s to the present day and, given his concentration on a small(ish) number of subjects, making connections is almost unavoidable. Especially when, in the final two rooms, which house paintings chosen by the curator, there are canvases which resonate with others shown earlier in the exhibition. 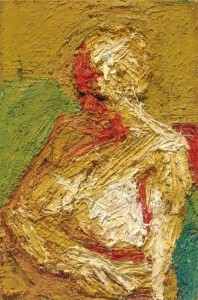 Auerbach’s technique is to draw with the brush, in oils or acrylic, or with charcoal. He regularly scrapes the day’s paint off the canvas at the end of the day, before starting afresh on the morrow. In his search for perfection a painting may take months to complete, even if the final product looks as if it is dashed off, but it may have taken up to 200 separate versions, all judged insufficiently good, to produce the final image. 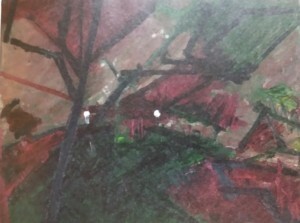 His canvases are sometimes thick with impasto, or a collection of squiggles and lines. In each case an image emerges, sometimes straight away, sometimes only after the viewer looks at the work for a period of time. On those occasions that the image didn’t appear for me, I think the fault was my own, though it helped to be able to go back and look again in certain cases, especially at the cityscapes. Auerbach once quoted Robert Frost on his own poetry ‘I want the poem to be like ice on a stove – riding on its own melting.’ A great painting, he said, ‘is like ice on a stove. It is a shape riding on its own melting into matter and space; it never stops moving backwards and forwards.’ So a painting is more than a representation, figurative or otherwise, of a time and a place, or person, though it is that. What else it is? The captured feeling and sensations of high summer on the Hampstead Road, 2010 ( above left ) with its hot light and whizzing skateboarder and or of a winter’s night on Primrose Hill, with its distant lights through the trees crashing in the wind? And how that feeling as well as that image resonates through time and with other people. At least that’s what it seems like to this unsophisticated viewer. My personal favourites were the aforementioned Hampstead Road, High Summer, Winter Evening, Primrose Hill, the wonderful charcoal and graphite heads and some of the studies of Julia ( the artist’s wife ) and E.O.W. The exhibition is well worth a visit. Entrance costs £14.50 (£16 with donation ) and concessions are available. It runs until 13th March 2016. 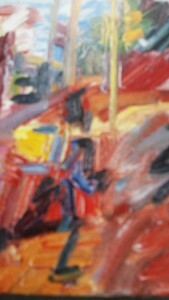 Check out the Tate Britain web-site for opening times and other information on Auerbach and the paintings on display. Mine too ( and the sanity clause ).